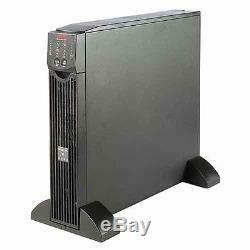 APC Smart-UPS RT 700W 1000VA 230V. We are here to help 01274 471 201. < Back to UPS Battery Backup. DB-9 RS-232/SmartSlot Rack Height 2U Extended Runtime Model. Your satisfaction is our No. A versatile UPS developed for the harshest power conditions in the world - APC Smart-UPS RT is a family of high-density, performance UPSs for voice and data networks, medical labs, and light industrial applications. 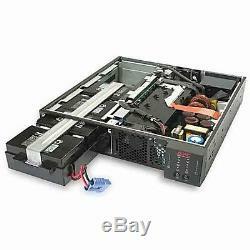 Capable of supporting 10kVA in a 6U rack/tower convertible form, users can support power hungry blade servers or heavily loaded equipment racks. This flexible form factor allows standardization across multiple applications. High power internal chargers allow virtually unlimited additional matching battery packs to comply with aggressive runtime demands of business-critical systems. Customers with harsh power environments looking for extremely tight voltage and frequency regulation, internal bypass, and input power factor correction typical of double conversion online topology will get them in the Smart-UPS RT. APC Smart-UPS RT Rack Height 2U Extended Runtime Model. Output Power Capacity: 700 Watts / 1000 VA. Output Connections: (6) IEC 320 C13 (2) IEC Jumpers. Interface Port(s): DB-9 RS-232, SmartSlot. Maintenance-free sealed Lead-Acid battery with suspended electrolyte : leakproof. Two years repair or replace. 160 to 280 V AC. Full time multi-pole noise filtering : 0.3% IEEE surge let-through : zero clamping response time : meets UL 1449. LED status display with load and battery bar-graphs and On Line : On Battery : Replace Battery : Overload and Bypass Indicators. Alarm when on battery : distinctive low battery alarm : overload continuous tone alarm. Typical backup time at half load. Typical backup at full load. (6) IEC 320 C13 (2) IEC Jumpers. C-tick, CE, EN 50091-1, EN 50091-2, EN 55022 Class A, EN 60950, EN 61000-3-2, GOST, VDE. 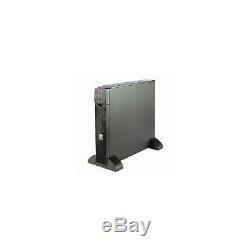 Smart-UPS RT 1000VA Model, CD with software, Smart UPS signalling RS-232 cable, User Manual. We are a long established (15 years) specialist computer company, with a multi million pound turnover and over 55 highly trained staff with hundreds of years experience between them. We are based just outside Bradford near the M62. We are run by enthusiasts, not shareholders. We are not a "stock shadowing" retailer operating from a back room, like many supposed IT specialists , we will be here when you need us. Visit our brand new specialised showroom near Leeds. We design and build our own multi award winning systems, as well as supplying over 10,000 other lines. We have very strong relationships and a high level of support from the major players in the IT world, we are proud to be one of the few IT companies in the highest partnership echelon for Intel, Microsoft, and many others. CCL won the prestigious "PC Pro" Online retailer of the year award three years running - a testament to our dedication to you, the customer. We have a very busy website attracting 300,000 unique visitors every month and process. Every year we process 200,000 orders delivering to all parts of the UK and Europe. Choose Other 24 Hour Courier. The item will be sent by courier direct from our supplier. Choose Other 48 Hour Courier. We will then send your item via DPD - a service with numerous advantages. No need to stay in all day! This is a fully tracked service. You will be able to track the parcel online at all stages of its journey. Other EU countries take slightly longer. Deliveries to Denmark, Italy, Portugal, Spain and Sweden use a different courier. Add all the items you want to your basket. Proceed to the checkout from the basket and pay. If you order and pay for items separately, we are unable to apply carriage discounts. How much can you save? How will I know when my order has been dispatched? How long will it take for me to get my order? What do I do if I have not received my order when expected? DPD Courier Please check your tracking details and contact the courier to trace your parcel. Please note that couriers can deliver up until 7pm. What if there is an item missing or damaged? Some orders may be dispatched from different warehouses to be with you as soon as possible. If the time is not convenient, you can reply to choose a different day. If you are unavailable, the courier should leave a calling card and take the parcel back to your local depot. Alternatively, you can collect the parcel from your local depot. Simply stick this on your parcel and take it to your nearest Post Office. For larger items, we can arrange a DPD courier to collect the item from your address. For faulty or incorrectly described items, we provide the above service free of charge. If you change your mind and want to return an item, we can provide the above service for a small charge. Why Choose CCL For Your Order? 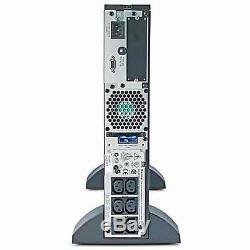 The item "APC Smart-UPS RT 700W 1000VA 230V" is in sale since Friday, April 17, 2015. This item is in the category "Computers/Tablets & Networking\Power Protection, Distribution\Uninterruptible Power Supplies". The seller is "cclcomputers" and is located in Bradford. This item can be shipped to United Kingdom.